Beads just wanna have fu-un, ya beads just wanna have fuuuuun!! Party animals! Hope you received your new components! 1. I love The Hours. love love love it - one of my top 5 books. the movie was great too. 2. I too use the baggies - i put the baggies in those compartment bins. I like how they look baggie-less, but in baggies i can fit more beads, and after the great bead spill (4 trays of no-baggie beads all.over.the.garage), i bag 'em. I'd rather hear the "plop" of baggies hitting the ground that then scatter-scatter-scatter of lotsa beads running amok. Looks like you have quite a bead collection!! Organizing beads is like herding kittens…I commend you on your efforts to get them to behave. And your new design is precious. Oh, my, 'the hours' is one of my all time favourite books. I loved it and I actually loved the movie as well. I'm quite tickled by the idea of all of your beads having a party while you've been out of the room. 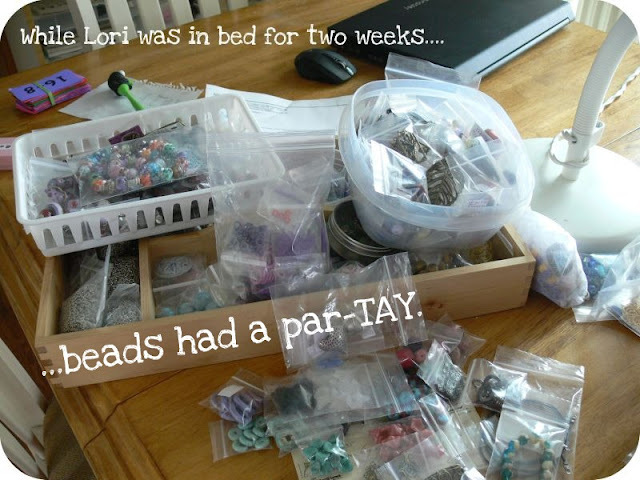 Maybe that's what happened in my studio, a drunken, wanton, all night, all week bead fiesta. 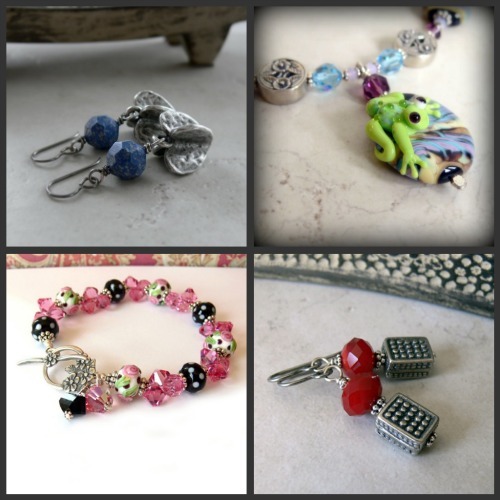 As a quilter reading a beading blog, we have lots in common. My hubby and I just had a conversatin 5 minutes ago about whether or not I have enough material, as it falls out of my sewing room! It beats many other vices...I think? Baggies for me every time. 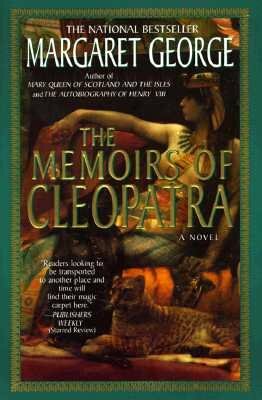 I liked Cleopatra but for my money it was her Henry VIII. She does a good job of making historic figures into people. You are just too hilarious! We store things in the same way--plastic bags and containers. I think it's a good way to do it. Your beads look gorgeous! I'm drooling. Well, I don't show my table out of full embarrassment. After a month a half working on my bed in a sort of odd position, My husband had to bring me one Tv table where I have all my tools and beads, and bags (I also have to bag everything! )by my bed and I work on one of those computer trays from Ikea. I tried some hammering today, but it wasn't that great idea. So I just keep on what I've been doing lately. Not much, and messing all my stuff. I wish I could read, but there is a medication that makes my eyes go funny. The good thing.. I am two and half months closed to recovery. Have a good day and don't worry too much, there is some sort of fun on tidying beads. This is a time old predicament with any hobby of mine: I have to go to the store for some banal thing like string or clasps or tiger tail because I'm about to run out. When at the store who could resist those lovely precious beads and findings just calling out to me? So of course I end up buying a bunch of beads and whatnot...and forget to buy the essentials I came in for. I tell these beads are like Oedipus' Sirens! wow! I'm overwhelmed just by looking at the blog post! I would have a field day just running my hands OVER all those beads...you lucky, LUCKY lady! 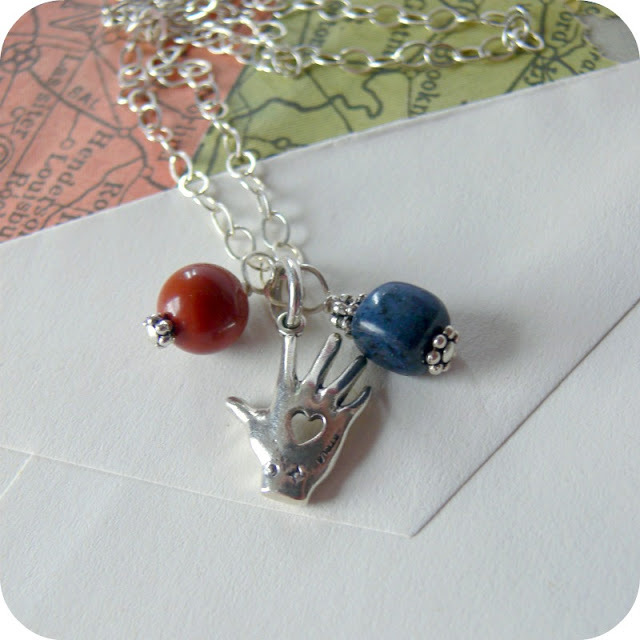 Love the sweet new Hand to Heart necklace. I don't know how to stop the beads from multiplying and spreading themselves all over the desk. It's a conundrum! My bead area has exploded to take over my chair and parts of the floor around it. I have a small area in the living room. (soon to be getting a portable unit outside.) I would take pictures but it would be pure embarrassment. 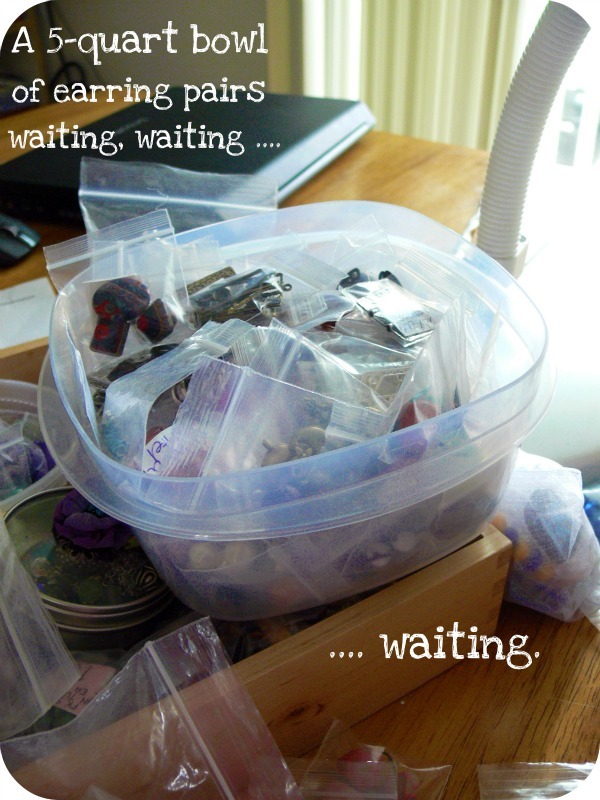 I have all my finished items in baggies. Trying to get a place for everything. I have a pile of things to be photographed. I also bought this Beading Manager Software that hopefully will help me de clutter and keep it all manageable. Love the beads you have!! I can totally relate. I'm a bead hoarder too! After every project it looks like a tornado came by. and yes, I have bead strings that I just had to buy, that I still haven't used. BHA (bead hoarders anonymous) lol. I loved your book suggestions! I will bookmark them (no pun intended) and eventually add them to my ever- growing stack. And yeah... I think I could be a hoarder, too. A bead here, a sheet of felt there, and BLAM, every empty drawer is, all of a sudden, packed with stuff that has only ever seen the light of day once- when I took it out of the shopping bag to put it in there. SIGH. Bead Hoarders Unite! I will go with you on Hoarders - maybe we can get some kind of two for one deal? 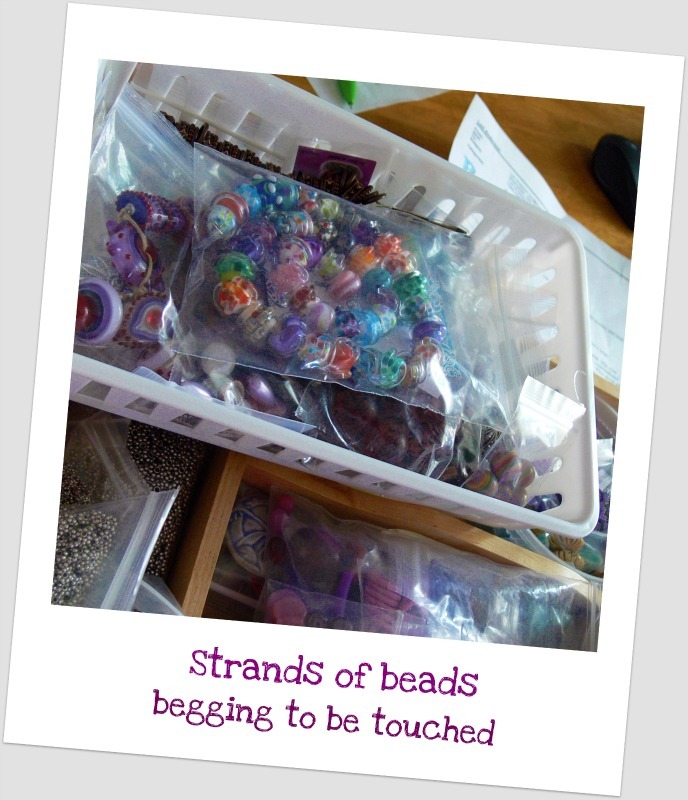 What I need them to do is clear everything that is NOT a bead out of my house so I can have room to spread out my beads and then maybe I'd actually know what I have and be able to FIND it. Oh, and that strand of lampwork beads in that one picture - YUMM! !